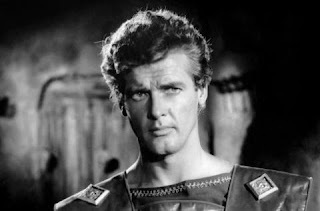 Spaghetti Cinema: Roger Moore on the first day on SABINES. "Anyhow, my first scene was with Mylene Demongeot, who spoke her lines in French. As soon as her lips stopped moving, I chipped in with, 'You mustn't be afraid, we mean no harm.' She then replied in French about all men being liars and, again as soon as her lips stopped moving, I knew it was my turn. We managed to get through some of this, with Beka continually shouting her Serbian directions in the background, when a man in the crowd wearing a white toga emerged and punched me squarely in the jaw; knocking me flat on my back. "'Because that man just punched me,' I replied. "'Beka! Why did that man punch Roger?' the director asked. "'Because he is drunk,' was her reply. "'Ce qui? Un double? Je ne comprends pas.' All of a sudden, Pottier didn't speak English any more. "'Oh no. On ho! If he is to double me, then you will make clothes for him,' I replied. It was an ordeal. And that was only the first day."